21 is a 2008 American heist drama film directed by Robert Luketic and starring Jim Sturgess, Kevin Spacey, Laurence Fishburne, Kate Bosworth, Liza Lapira, Jacob Pitts, Aaron Yoo, and Kieu Chinh. The film is inspired by the true story of the MIT Blackjack Team as told in Bringing Down the House, the best-selling book by Ben Mezrich. Despite its largely mixed reviews and controversy over the film's casting choices, 21 was a box office success, and was the number one film in the United States and Canada during its first and second weekends of release. Ben Campbell (Jim Sturgess), a mathematics major at MIT, is accepted into Harvard Medical School but cannot afford the $300,000 tuition. He applies for the prestigious Robinson Scholarship which would cover the entire cost. However, despite having an MCAT score of 44 and high grades, he faces fierce competition, and is told by the director that the scholarship will only go to whichever student dazzles him. Back at MIT, Professor Micky Rosa (Kevin Spacey) challenges Ben with the Monty Hall Problem which he solves successfully. After looking at Ben's 97% score on his latest non-linear equations test, Rosa invites Ben to join his blackjack team, which consists of fellow students Choi, Fisher, Jill, and Kianna. Using card counting and covert signalling, they are able to increase their probability of winning while at casinos, leading them to earn substantial profits. Over many weekends, the team is flown to Las Vegas and Ben comes to enjoy his luxurious lifestyle as a so-called big player. The team is impressed by Ben's skill, but Fisher becomes jealous and fights him while drunk, leading Rosa to expel him. Meanwhile, the head of security, Cole Williams (Laurence Fishburne), has been monitoring the team and begins to turn his attention to Ben. Ben's devotion to blackjack causes him to neglect his role in an engineering competition, which estranges him from his friends. During the next trip to Las Vegas, he is emotionally distracted and fails to walk away from the table when signaled, causing him to lose his earnings of $200,000. Rosa is angered and quits the team, demanding that Ben must repay $200,000. Ben and three of the students decide that they will continue to play blackjack without Rosa, but they are caught by Williams, whom Rosa tipped off. William beats up Ben and warns him not to return. Ben learns that he is ineligible for graduation because his course taught by Professor Rosa is marked as incomplete. Furthermore, his winnings are stolen from his dormitory room. Suspecting Rosa, Ben confers with the other blackjack students, and they persuade Rosa to make a final trip to Las Vegas before the casinos install biometric software. The team puts on disguises and returns to Planet Hollywood, winning $640,000 before they are spotted by Williams. Rosa flees with the bag of chips, jumping onto a limousine, but discovers that it's a setup to give him to Williams. It is revealed that Ben and Williams made a deal to lure Rosa to Las Vegas so that Williams may capture and beat him, because Williams has past grievances against him. Williams proceeds to hold Rosa hostage and subject him to beatings. In exchange, Williams allows Ben to play for one more night in Las Vegas, enjoying immunity from capture. However, as Ben is leaving with his earnings, Williams betrays him and takes the bag of chips at gunpoint. Ben protests, and Williams explains that he needs retirement funds, whereas intelligent people like Ben will always find a way to succeed. The film ends with Ben recounting the entire tale to the dazzled scholarship director. Jeff Ma (as Jeffrey Ma) as Planet Hollywood Dealer Jeff (the person upon whom the story was based). The filming of 21 began in March 2007. Principal filming of the Las Vegas scenes took place at the Planet Hollywood Resort & Casino, the Red Rock Casino, and the Hard Rock Casino in Las Vegas. Filming also took place at Harvard Medical School, Chinatown, in Cambridge, and the Christian Science Center in Boston, Massachusetts. As Massachusetts Institute of Technology did not allow filming on campus, the MIT school and dorm interiors, the gymnasium, and the alumni reception were all shot at Boston University. 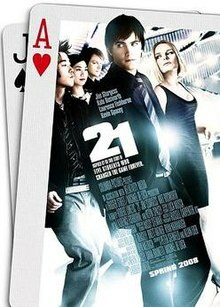 21 received mixed reviews from critics. Review aggregator Rotten Tomatoes reported that 35% of 167 critics gave the film a positive review, for an average rating of 5.2/10. The site's critical consensus reads that "21 could have been a fascinating study had it not supplanted the true story on which it is based with mundane melodrama." Metacritic reported the film had an average score of 48 out of 100, based on 29 reviews. In its opening weekend, the film grossed $24,105,943 in 2,648 theaters in the United States and Canada, averaging $9,103 per venue and ranking first at the box office. The film was also the number one film in its second weekend of release, losing 36% of its audience, grossing $15,337,418, expanding to 2,653 theaters, and averaging $5,781 per venue. The film dropped to third place in its third weekend, losing 32% of its audience, grossing $10,470,173, expanding to 2,736 theaters, and averaging $3,827 per venue. By the fourth weekend it fell to sixth place, losing 47% of its audience, grossing $5,520,362 expanding to 2,903 theaters, and averaging $1,902 per venue. By the end of its theatrical run, the film grossed a total of $157,802,470 worldwide — $81,159,365 in the United States and Canada and $76,643,105 in other territories, against a budget estimated at $35 million. A race-based controversy arose over the decision to make the majority of the characters white Americans, even though the main players in the book Bringing Down the House, upon which the film 21 is based, were mainly Asian-Americans. The lead role was given to London-born Jim Sturgess, who required a dialect coach to speak with an American accent. Jeff Ma, who was the real-life inspiration for the character Ben Campbell and served as a consultant on the film, was attacked as being a "race traitor" on several blogs for not insisting that his character be Asian-American. In response, Ma said, "I'm not sure they understand how little control I had in the movie-making process; I didn't get to cast it." Ma said that the controversy was "overblown" and that the important aspect is that a talented actor would portray him. Ma, who is Chinese American, told USA Today, "I would have been a lot more insulted if they had chosen someone who was Japanese or Korean, just to have an Asian playing me." Nick Rogers of The Enterprise wrote, "The real-life students mostly were Asian-Americans, but 21 whitewashes its cast and disappointingly lumps its only Asian-American actors (Aaron Yoo and Liza Lapira) into one-note designations as the team's kleptomaniac and a slot-playing 'loser.'" The Media Action Network for Asian Americans (MANAA) reported on their web site: "After the ‘white-washing’ issue was raised on Entertainment Weekly’s web site,  producer Dana Brunetti wrote: "Believe me, I would have LOVED to cast Asians in the lead roles, but the truth is, we didn’t have access to any bankable Asian-American actors that we wanted." 21 was released on DVD and Blu-ray in Region 1 on July 21, 2008. In pre-production, the producers and the book's original writers predicted that the Vegas casinos would be unhelpful, as a film that told viewers the basics of card counting might hurt their bottom line. A featurette included with the DVD completely and accurately describes the "Hi-Lo" system used by the MIT Blackjack Club and by Rosa's team in the film. In fact, the writers were surprised when told by the producers that MGM Studios would finance the film, though all "MGM" casinos (including one used by the real MIT Blackjack Team) are owned by MGM Resorts International and are no longer related to MGM Studios. In reality, as another DVD featurette reveals, the casinos (including MGM Resorts) saw the film as an attention-getter; people who saw it would be encouraged to go to Vegas and play: some just for fun and some attempting to count cards but failing to learn or memorize the entire strategy or making too many mistakes. The film withheld critical strategy details (such as the conversion from the "running count" to a "true count"), and most beginning card counters underestimate the number and value of the mistakes they make. Although it is not included in the soundtrack, Moby's "Slippin' Away" (Axwell Vocal Remix) plays in the scene when Ben is passing through airport security. The song "Everybody Get Dangerous" by Weezer was also featured in the film, but not included on the soundtrack since it was not yet released. It would later be released on Weezer's 2008 record, The Red Album. It is played on a distant radio when the team is in a poker club. The songs "I Want You to Want Me" by Cheap Trick and "Music is Happiness" by The Octopus Project were also featured in the film but not on the soundtrack album. The song "Magnificent" by Estelle (feat. Kardinal Offishall) was also featured in the film but not on the soundtrack album. It's played approximately 58 minutes in, after the Weezer song, in the scene where Ben buys Jill a beer. It's subtle, and has a reggae beat. In the promotional trailers, "Break on Through (To the Other Side)" by The Doors was used. During the restaurant scene where the team explains to Ben how they work, "Home" by Great Northern can be heard playing in the background. The song "Again with the Subtitles" by Texas artist Yppah is another uncredited song in the film. The track played as the team makes off at the end of the film is "Rito a Los Angeles" by Giuseppe De Luca, which features part of the main riff of "In-A-Gadda-Da-Vida". This track is also used in Ocean's Twelve, the first sequel to the caper film Ocean's Eleven, about actually robbing casinos in Vegas. My Mathematical Mind by Spoon was featured in the trailers. ^ "21 Movie Reviews, Pictures - Rotten Tomatoes". Rotten Tomatoes. Archived from the original on 22 November 2009. Retrieved June 21, 2018. ^ "21 (2008): Reviews". Metacritic. Archived from the original on 2 April 2008. Retrieved 2008-04-02. ^ "21 (2008) - Weekend Box Office Results". Box Office Mojo. Retrieved 2008-04-06. ^ "21 (2008)". Box Office Mojo. Retrieved 2008-04-28. ^ "Real MIT Blackjack Team - 21 Movie True Story". chasingthefrog.com. Retrieved March 31, 2013. ^ Janusonis, Michael. "Movies: 21 star Jim Sturgess got a crash course in card counting". projo.com. Archived from the original on April 11, 2008. Retrieved 29 May 2015. ^ Justin Berton (2008-03-27). "Hollywood deals Jeff Ma a good hand with '21'". San Francisco Chronicle. Archived from the original on 29 March 2008. Retrieved 2008-03-29. ^ Berry, Jillian A. (March 14, 2008). "INTERVIEW MIT, Vegas, Hollywood". The Tech. Retrieved March 31, 2013. ^ Bowles, Scott (2008-03-26). "New film '21' counts on the real deal for inspiration". USA Today. Retrieved 2010-04-23. ^ Nick Rogers (2008-03-26). "When the stakes are high, '21' folds". The Enterprise. Archived from the original on 2008-04-01. Retrieved 2008-03-29. ^ "CONTROVERSY STILL SURROUNDS DVD RELEASE OF MOVIE "21"". manaa.org. Archived from the original on 2013-10-04. Retrieved March 31, 2013. ^ "21 (Single-Disc Edition) (2008)". Amazon.com. Retrieved March 31, 2013. ^ a b Brown, Marisa. "21 [Original Soundtrack]". AllMusic. Retrieved 2008-04-02.